F-86 Sabre jets are transonic military aircraft built by North American. The F-86A entered service in the USAF during February 1949 and was upgraded a short time later. On December 22, 1949 the F-86D, also briefly known as the YF-95A, made its first flight. 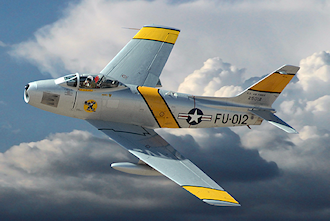 Subsequently 2,054 F-86Ds were built, making it the most produced plane in the series. It earned the the unique distinction of succeeding itself in setting a new world's speed record -- 698.505 mph on Nov. 19, 1952, and 715.697 mph on July 16, 1953. It was also the first single-seat day or night all-weather fighter-interceptor. The F-86D was also the first USAF airplane equipped exclusively with rocket armament. A pod containing twenty-four 2.75 "Mighty Mouse" air-to-air rockets was located in the belly. The pod was lowered into the airstream in order to fire the rockets, then quickly retracted so as not to affect the speed or handling characteristics any more than necessary. The pilot had to take great care to insure each rocket had cleared its tube when fired. If a rocket was hanging halfway out the tube and the pod were retracted, the rocket would explode. If the pilot wasn't absolutely sure of the position of the rocket, he landed the Sabre with the pod extended. During such an incident in 1957 at Wheelus Field, Libya, the instant the Sabre touched down, the rocket fired and blasted a 15-foot hole in a rock security fence nearly a mile and a half away! The F-86H was a fighter/bomber armed with six 50 calibre machine guns. Both the F-86D and F-86H required the Sabre pilot to be in visual contact with the enemy in order to attempt a shoot-down, thereby making it the last true 'dogfighter' in the Air Force inventory. The F-86 was used by the air forces of 24 different countries until the early 1980s. Powerplant: Single General Electric J47-GE-17B afterburning engine. Armament: Twenty-Four 69.9mm air-to-air rocket projectiles. Chapter One of Edward J. Ruppelt's classic UFO exposé The Report On Unidentified Flying Objects opens with,"In the summer of 1952 a United States Air Force F-86 jet interceptor shot at a flying saucer." Below is an updated extract of that incident that includes the location of the air force base and the month that the sighting took place. About ten o'clock in the morning, during September 1952, Kirtland AFB radar picked up an unidentified target approaching at about 700 miles per hour, then slowing to about 100 miles per hour northeast of the airfield, over a sparsely settled area. The radar picked up the F-86's soon after they were airborne, and had begun to direct them into the target when the target started to fade on the radarscope. At the time, several of the operators thought that this fade was caused by the target losing altitude rapidly and getting below the radar's beam. Some of the other operators thought that it was a high-flying target and that it was fading just because it was so high. The second pilot, was descending to 5,000 feet and was just beginning to pull out when he noticed a flash below and ahead of him. He flattened out his dive a little and headed toward the spot where he had seen the light. As he closed on the spot, he suddenly noticed what he first thought was a weather balloon. But a few seconds later he realized that it couldn't be a balloon because it was staying ahead of him. Quite an achievement for a balloon, since he had built up a lot of speed in his dive and now was flying almost straight and level at 3,000 feet and was traveling near the speed of sound ( about 768 mph. ). Again the pilot pushed the nose of the F-86 down and started after the object. He closed fairly fast, until he came to within an estimated 1,000 yards. Now he could get a good look at the object. Although it had looked like a balloon from above, a closer view showed that it was definitely saucer-shaped. The pilot described it as being "like a doughnut without a hole." When the object traveled out about 1,000 yards, the pilot suddenly made up his mind and did the only thing that he could do to stop the UFO. It was like a David about to do battle with a Goliath, but he had to take a chance. Quickly charging his guns, he started shooting . . . . A moment later the object pulled up into a climb and in a few seconds it was gone. The pilot climbed to 10,000 feet, called the other F-86, and now was able to contact his buddy. They joined up and went back to their base.